Input text: the beach backdrop. the swimmer is two feet right of the 14 foot tall house. the white light is in front of the swimmer. the woman is right of the swimmer. the magenta light is above and right of the house. it is in front of the house. the house is 7 feet in the huge sand hill. a yellow light is above the magenta light. the house is leaning left. the upside down zebra is two feet in front of the swimmer. 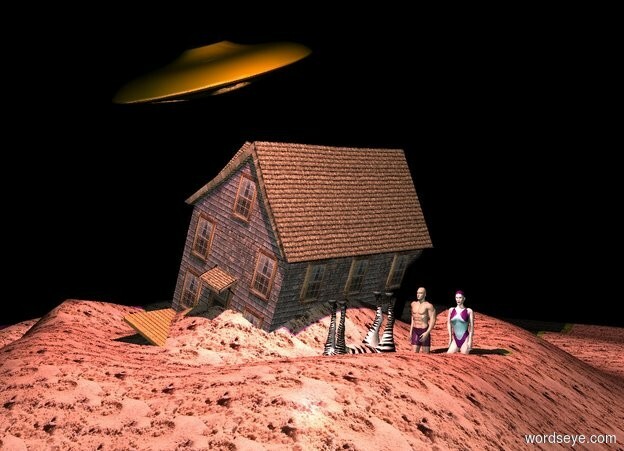 the 4 foot tall gold ufo is -2 feet above the house.it is -10 feet in front of the house. it is facing right. it is leaning right. it is night.